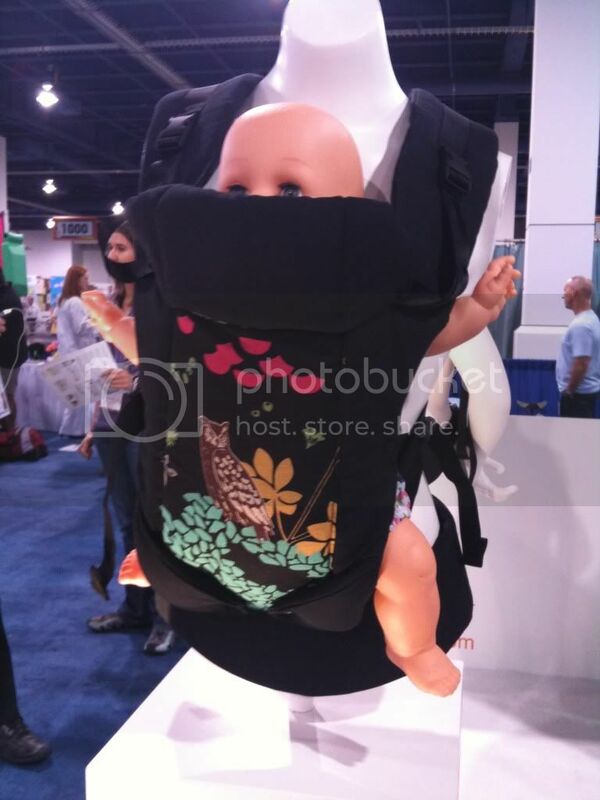 Along with all of the amazing cloth diaper products unleashed at ABC Kids Expo, baby carriers were also introducing some very exciting products! First, the one I am most excited about, the Boba from NAP, the makers of Sleepy Wrap. Boba is a Soft Structure carrier (SSC) that is intended for toddlers 1-4 years old and around 20 pounds and up. Boba has a few extra inches of height to keep the toddler’s body safe and secure. The coolest thing about it: there are foot straps attached to the waist belt for the child’s feet to sit in. This enables a healthy sitting position for the child. The optimum position for a baby being worn is a frog leg position with the knees close to a ninety degree angle, which is the goal of this carrier. As long as the child is cooperative, this is a great way to continue babywearing as your baby is heavier and older. Right now the carrier comes in solid colors and one print, with plans for more prints in the future. It will retail for around 99 and be shipping sometime in late September. Want a peek? Hotslings also had two new products to announce at ABC. Hotslings AP (Adjustable pouch) is an innovative hybrid between a pouch sling, their signature item, and a ring sling. There are two straps in the pouch, one in the upper rail and one in the lower rail, that can be easily adjusted to tighten or loosen. The buckles are hidden underneath a pouch of fabric to keep baby from playing with them. The straps replace the ring and long tail of fabric in ring slings, and offers a nice option for people who want a compact diaper bag size carrier but don’t like the non adjustability of pouch slings. It is coming out in 6 signature prints and is paired with a drawstring bag for taking along in your bag. The pouch should fit Hotslings sizes 2-5. I always enjoyed the idea of Hotslings but not the restriction of the size. Plus, women who are in the process of losing weight or who are pregnant will need to adjust the size over time. I am really excited to try the AP out. Hotslings has also unveiled a nursing cami called Milkcraze, which is a pull over top. As I mentioned before, Beco has plans for a multi functioning carrier, the Gemini. The Gemini offers babywearers the option of front facing, tummy to tummy, and back carries. While front facing is not recommended for long periods of time because it strains the wearers back and it isn’t the best position for the baby either, many parents are demanding that their carriers have that option. The Gemini has a snap adjusting seat that can expand or contract to accomodate rear or front facing, The fabric panel in the middle can also be snapped down. Baby Hawk introduced their new designs courtesy of the men behind Ruthless and Toothless, a tattoo inspired baby and children’s clothing line. These men also happen to be from the show Miami Ink. Expect really funky old school designs and fun colors. These aren’t available yet but will be in a few weeks. Cybex is a carrier I bet you haven’t heard of. The 2.GO Cybex Baby Cariier is being distributed by Regal Lager, who also distributes the Bambino Mio and Diaper Dekor, and will be available in the US soon. The Cybex is a very masculine and modern looking carrier with many functions. It can back carry, front carry tummy to tummy, and front face carry. It can also accommodate newborns and has special leg straps to keep their little bodies contained inside and prevent them from slipping out of the leg holes. The seat has a zipper that when open gives larger babies more seat room and maintains the fabric width needed for their comfort. The middle fabric panel can fold down for larger babies who want arm mobility. The back middle strap (same as the chest strap for front facing) has a cool swivel feature which is handy for taking on and off. The colors are very hip, and I think the dads are really going to like this one. It will retail for 99.99. Ergo unveiled an new accesory to their line, the ♥2♥. This is a new “womb” like infant insert which is very lightweight but will cradle a newborn in comfrt. It looks similar to a cone with rolled edges, and is very soft. Moby has added new colors to their lineup, pacific, burgundy, and slate. They also unveiled a new design, a crescent moon and stars. Previous articleFabulousness, Kissaluvs One-Size, All-in-One Details and a sneak peek! Next articleWhat is in the pipeline at Dirty Diaper Laundry!